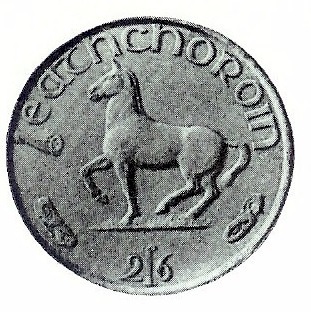 The half-crown (2s6d or 2/6) coin was a subdivision of the pre-decimal Irish pound, worth 1/8 of a pound. The halfcrown was commonly called “two and six” due to its value of two shillings and sixpence (indicated on the coin itself as ‘2s6d’). 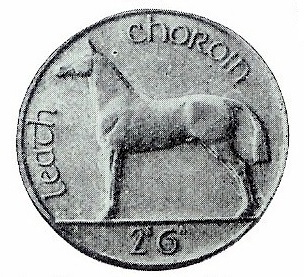 For almost half a century it was the largest circulating Irish coin – the 10/- piece of 1966 didn’t really circulate because the people at the time didn’t take to it – often complaining “haven’t we got a 10/- note.” The 10/- coin was quickly withdrawn when the price of bullion silver rose rapidly and the coin’s face value was less than its bullion value. The original issue of this coin from (1928 to 1943) contained 75% silver, a higher content than the equivalent British coin. The silver coins were quite distinguishable as they had a whiter appearance than the later cupronickel variety minted from 1951. The silver coins wore less well. 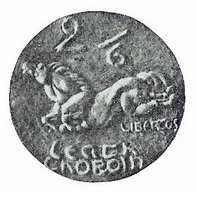 The subsequent cupro-nickel coin (1951-67) comprised 75% copper and 25% nickel. The coin measured 1.275 inches (32.4 mm) in diameter and weighed 14.1 grams. 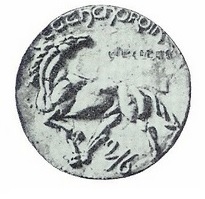 The reverse design of the coin, by Percy Metcalfe featured an Irish Hunter, a breed of horse. This design was used later for the twenty pence coin issued in 1986. 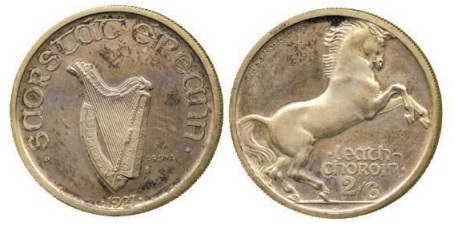 From 1939 to 1967 the inscription changed to éire on the left of the harp and the date on the right. The last half crowns were produced in 1967 and were withdrawn on 1 January 1970.